This product requires the base game Bounty Train. 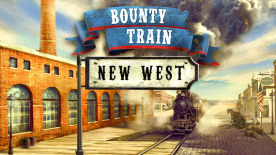 With "Bounty Train - NEW WEST" Walter Reed's story continues after the events of the Base Campaign. Take over control over your company and lead the building process of your new facility, move resources, hire specialists and pay bills to realize this massive project and set yourself up for expansion. Completing the Main Campaign is necessary to start the DLC Campaign. As soon as the Main story has been completed, you´ll receive a letter, leading you to the new Story hub.